I keep having issues with my Streamlined Redline RDM extension. Whenever I rig the sail dry it works fine. Once the rope gets wet it's pretty much impossible to downhaul without the rope slipping off the extension pulleys. All my sail pulleys are inline with the Streamlined extension pulleys; unlike Chinook. I'm pretty sure I'm threading the rope properly as there are no intersections anywhere and the rope's not rubbing on itself; works great when dry. I've tried to find an alternative method of threading the rope to move the tension inwards towards the extension so the rope doesn't slip but I haven't been able to. Any thoughts on stopping the rope from slipping when wet? It slips off both pulleys and only when wet. Your line ... wet, dry, or coated with Teflon and snot ... will not slip off the pulleys unless they are being pulled sideways. How the pulley axes are aligned is not important; what matters -- what prevents sideways pull on the line -- is whether each segment of line, the free section between any two pulleys, is lined up with the overall downhaul tension between the two blocks (the sail hardware and the extension hardware) when you're downhauled tightly. Imagine a horse standing still and facing north. His legs are straight, parallel, and aligned with the force of gravity. That's how all the line segments between your two pulleys should look. Now glue his feet to the ground, then rotate the horse so he's facing east. His legs now collectively define a spiral. I'll BET your line segments do, too; that's the only way I can envision the sideways force being generated. If not that, then I'll BET a line or two are crossed when everything is tight. Remember ... your winding pattern, not your relative pulley axis alignment, is what matters. If not one of those, then one of your pulleys is tilted in some distorted manner because it's binding somehow. Regardless, if you rig and tension the sail, then closely examine each end of each free, tight, downhaul line segment, you WILL find one or more segments exiting or entering its hole out of the plane of that sheave. Lace it up in whatever pattern it takes to fix that problem. the only thing I can think of is if maybe you have a lot of outhaul tension on your sail (like on a double luff race sail), so you're pulling the tack pulley away from the mast? maybe take a picture of your setup and post it here so we can better help. Are you threading your downhaul such that the line runs in opposition at each pulley like you would with a Chinook extension? I have found that if you do, the line will slip off the pulleys as higher tension is applied in the rigging process. With Streamlined's Quick6 design, the line must run in the same direction through the pulleys. 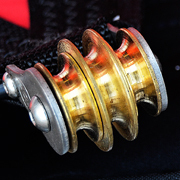 To quickly get to the heart of the matter, do as Kevin has suggested and post a photo of your threaded extension. A picture is worth a thousand words. This past weekend I was on a cambered sail and had to outhaul in order to get the cams in, so it did pull the pulley from the mast. But I had no issues when everything was dry. I usually have to switch to the Chinook extensions after I try to adjust the downhaul when everything's wet and it keeps slipping. I just give up. I just hate having this extension and not being able to use it properly. Unfortunately this isn't the first time this has happened. I've used other non cambered sails and have this happen on multiple occasions but ONLY after the pulleys/rope get wet. I can rig the sail PERFECTLY the first time around with NO ISSUES; cams or nocams. When everything's dry there's no problem. I have 8-9 sails though I've probably used this extension on 4-5 of them. Sorry, I don't have original pix but when I rig, it looks EXACTLY like this picture I found in another thread. Very easy to thread the rope as it's all inline. But the sail pulley sits way far out until you downhaul (I tried to outline that in red). So when it's wet, the rope just slips off both pulleys to the side. I've even tried to hold the rope with one hand and try to downhaul until the pulleys get inline this past weekend and it would keep slipping off, driving me nuts and going back to the Chinook. I couldn't make a slightest adjustment. The rope slipping happens ONLY after everything's wet. I have absolutely no problems rigging with this extension dry. The slipping happens only when I try to readjust the downhaul; if I don't touch it, there's no problem. try changing to a regular Chinook POLYESTER line. From the picture I posted earlier, I meant the rigging looks like that. (That's not my rig) I'm not using the Spectra lines. I'm using the original line that came with the extension. It's a black/white thread mix and looks like the line in the picture below. It does seem a little more slippery than the Chinook blue/black lines but that's just my opinion. I'll give the Chinook line a try, I have some of it. Maybe it's just parallax, but it looks like the line from the cleat to the outer sail pulley sheave is pulling sideways on that sheave. Not good. I use streamlined extensions and universals with HSM wave sails and I recall having this problem a few years back. Then in 08 or maybe 09 the clever folks at HSM came out with a new sail pully that solved the problem for any extension. The center pully is larger and deeper than the outer pullys and that stopped the lines from jumping towards the inner most (closest to the mast) pully when you downhaul. So, I guess you could consider buying a handfull of those special center pullys from Hot Sails Maui to retrofit your sails??? If your rigged sail looks like everything in the photo you posted, it appears that you've threaded everything right, especially if you're bringing the pulleys of both the extension and the sail as close together as pictured. I guess the question that comes to mind is where in the downhaul process does the wet line start to slip off? I'm assuming that it occurs well before final downhaul as pictured. Some sails want to pull away from the mast during rigging. I have a few like that, and I try to pinch the sail in close to the mast as I thread the line and start adding downhaul (before I start using a tool). Once I can get things get to the point where I attach the winch, the sail downhauls smoothly without a problem. 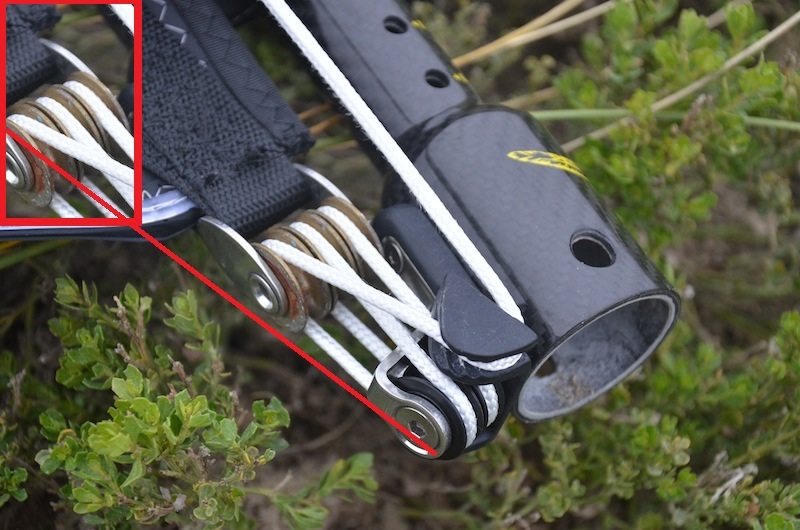 Also, by using a winch, you can continue to pinch-in the sail's pulley assembly as you apply the downhaul.